Sometimes I’m so busy thinking of content ideas for work that I forget about my blog. I just realised that I’ve forgotten to share something. A few months ago I emailed the ABC TV and submitted a photo I’d taken a month or two prior for their weather segment. Each night they show a viewer’s photo and say who took the photo. A week ago it was me. 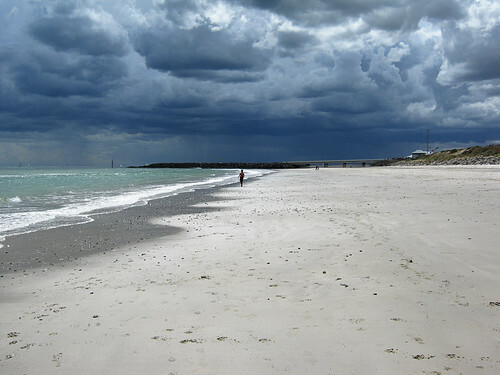 The photo above shows a beach scene with storm clouds coming in over West Beach. The person walking along the beach is my son and his mood was as stormy as the weather coming in. He’d been at a friend’s place for a day and night while The Surfer and I went to see Tom Jones at A Day on the Green. I don’t know why he was in such a snit when we picked him up but he was. A comedown from having a good time with his mate perhaps? Anyway, I hoped like crazy that I wouldn’t have to run and grab him to then run back to the car as a storm hit. Luckily I didn’t. That is an amazing photo, look at the colour of the sky. Congrats on making it to tv..and I love how there is a story linked to the pic..